The second annual Stars Of Paso Robles event will be staged twice in Southern California, so wine lovers in Los Angeles and Orange counties will both have access to the pleasures of Paso. Thursday May 12, 2011 is the date for the Costa Mesa version, while the Beverly Hills soirée is set for the following night, Friday May 13, 2011. The Costa Mesa event will be held at Charlie Palmer at Bloomingdale's South Coast Plaza. This is fitting, in that the restaurant is themed around wine. 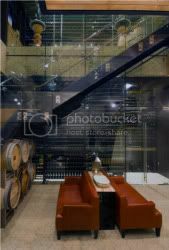 The floor is even made from reclaimed wine barrels. In Beverly Hills, the event will be held outdoors on the cobblestones of the Via Rodeo shopping street at Two Rodeo Drive. Both wine tasting events will run from 7:00 to 9:30 p.m. on their respective nights and tickets are available for $80 in advance, $150 at the door. Over two dozen wineries of the Paso Robles AVA are expected to turn out. Names like Cass, Terry Hoage, Hope Family Wines, Turley, Niner and Villa Creek will be joined by hidden gems Roxo Port, Lone Madrone, Alta Colina and Bodegas Paso Robles. Both events are presented by Learn About Wine, a group dedicated to the appreciation of fine wine and headed up by Ian Blackburn. LAW's Taste and Vintage members receive a discount on tickets. If you have yet to enjoy an Ian Blackburn wine tasting event, there's no point in waiting any longer. Blackburn is one of Southern California's leading wine educators. He puts winemakers and wine lovers together in an upscale environment and lets the wine do the rest. Always dressed impress, he'll be on hand - as usual - if you'd like to stop and share your thoughts on the wines you are tasting. Paso Robles, California is remembered by many as the place actor James Dean had hoped to drive through on his way to Salinas. Dean's life ended 25 miles short of Highway 101 when his speeding sports car collided with Donald Turnupseed's Ford. Today, that event - monumental at the time - is a footnote in the history of a city which is the center of the fifth largest wine region in California. The Paso Robles AVA comprises two thirds of the Central Coast AVA which contains it. Well over 200 wineries call Paso Robles home, and the number seems to grow every time you check. That fateful intersection of Highways 41 and 46 is memorialized for the legendary car crash which took place there, but in Paso, it's all about the wine. Paso Robles is most noted for Zinfandel grapes and the wines produced from them, but despite all the festivals held in its honor, Zin actually accounts for only nine percent of the grapes grown there. Cabernet Sauvignon and Merlot cover over half of the pie chart for Paso Robles grape varieties in the AVA's 29,000 acres of vineyards. Over $650 million worth of wine is produced annually in the Paso Robles AVA. Paso - just call it that if you want to sound local - is situated about a half hour north of San Luis Obispo on U.S. Highway 101. The area around Paso Robles is roughly divided into East and West sides, with the freeway as the dividing line. It would be hard to get around in the city and its environs without noticing the wine industry. No matter where you are in Paso, you're near a winery. If you plan to visit, you are one of 1.2 million tourists who do so each year for Paso wine. There are plenty of hotels, bed & breakfasts and vacation rentals to choose from. I received complimentary lodging at La Bellasera Hotel and Suites for the purpose of this series of articles, and it came highly recommended by everyone I spoke with before the trip. I found it much to my liking, too, and with room rates starting under the $200 mark, I'll check with them first on my next visit. La Bellasera's Director of Sales Baxter Boyington told me there are over 1250 hotel rooms in Paso Robles. He sang the praises not only of his hotel, but of life in Paso, too. He said returning to his stomping grounds was a distinct pleasure. As Boyington showed me around the property it was apparent that it's not a huge hotel, but the rooms are clean and outfitted in comfortable elegance, with attention to detail. There are even suites with kitchenettes if your stay is an extended one. A big television in my room never got turned on - no time for TV - but the free WiFi is a must nowadays. A spa and a fitness room offer amenities for those who wish to take a break from wine for a while. The restaurant at La Bellasera, Enoteca, is appropriately wine-themed and was also on every must-try list I acquired from locals. Steamed clams and mussels are a treat that's hard to pass, and the menu has a number of seafood options, veal, lamb, pork and Angus beef. If you only have time for dessert, try the country style cheesecake or gingerbread creme brulée. The bar at Enoteca is a favorite hangout for wine people of all stripes. I made new wine friends there, and I'd bet that you will, too - the people in Paso Robles are very friendly. Of course, the wine list at Enoteca is Paso-centric. As I mentioned, wine is everywhere in Paso Robles. Wineries and tasting rooms abound on the eastside and the west, all the way to the coast. Paso's downtown square just west of the 101 freeway features a number of tasting - and dining - opportunities within easy walking distance. One tasting room is interesting in that it serves as a tasting room for six of the smaller local wineries. 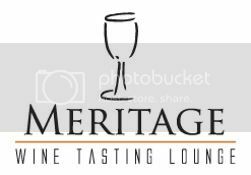 TheMeritage Wine Tasting Lounge has a large room lined with tasting bars. The night I visited, only four of the winery spaces were staffed, but on weekends you'll find all six wineries represented. Meritage hosts Roxo Port Cellars, Line Shack Wine,Brochelle Vineyards, Cerro Prieto, Michaud Vineyardand JK Wine Company, home of the Arada and Katinlabels. When you check in at the front desk you are handed a card which you use at the tasting bars. 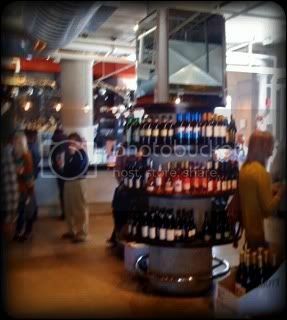 You can taste a flight or single wines at each of the stations, then settle up at the desk on your way out. Brochelle Vineyards had a flight of three wines which could be paired with cheeses. I tasted their Grenache/Syrah/Zinfandel Rosé made from estate fruit. The Jolly Rancher nose and candylike finish has citrus notes and clove in the middle. The Estate Zinfandel sports black cherry and licorice, while their Napa Cabernet Sauvignon is dark and rich, sourced from Mt. Veeder. Michaud Vineyard poured three wines made from Chalone grapes in Monterey County. The Chardonnay, Pinot Noir and Syrah all bing a lot to the table. The Arada Las Ramblas Blanca is a blend of Central Coast Chardonnay, Viognier, Grenache Blanc and Albarino. It has a full mouthfeel and crisp acidity that's really refreshing. I saved Roxo's Port-style wine for last. This producer has been a favorite of mine when I have encountered them at tasting events. Their 2007 Negrette shows flavors of black figs and raisins. Pairing it with chocolate brought the spice notes to the forefront. Speaking of chocolate, right down the street from The Meritage there’s a great candy store,Powell’s Sweet Shoppe, where I had the most enormous peanut butter cup known to mankind. 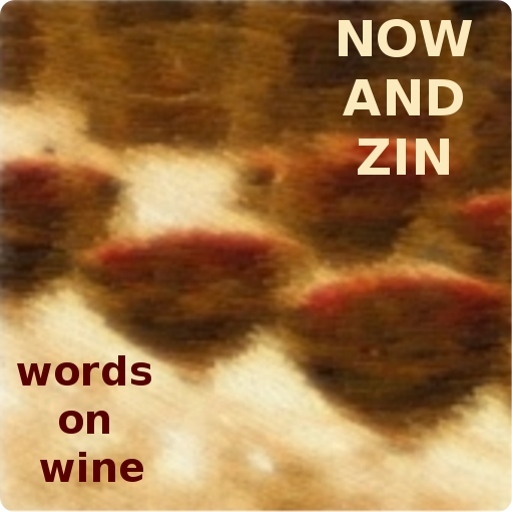 I hope you'll keep checking in to the Now And Zin Wine Blog for more articles about the wines and the people I encountered in Paso Robles. For spicy Asian food, I generally like to call for the Gewürztraminer. I also like it with duck, smoked salmon and cheeses, but its true calling seems to be as a mate for spicy foods. A recent visit to P.F. Chang's China Bistro in the Beverly Center in Los Angeles found me with a glass of a Washington State Gewürz in front of me, from Covey Run. 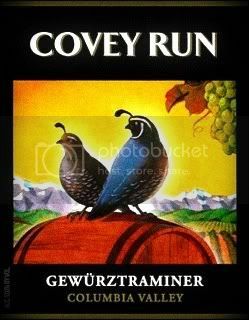 The Covey Run website states that they use "grapes grown in the Columbia and Yakima valleys, Washington State’s finest growing regions." For this Gewürztraminer, they continue, "Our Gewürztraminer vineyards are located in the cooler parts of Washington’s Yakima Valley, planted at higher elevations and even on northerly facing slopes. Gewürztraminer grown in these areas attains high sugar levels, spicy flavors and a lovely red skin color at harvest, much as it does in its native Alsace." The 2008 vintage is 100% Columbia Valley AVA Gewurztraminer - earlier vintages featured slight traces of Muscat Canelli or Muscat Ottonel. The floral, fruity nose is immediately inviting, and flavors of peach and pear are joined by a good minerality and light acidity. The wine paired reasonably well with the fried string beans but really showed its worth with the very spicy pork ribs. The Santa Monica restaurant called The Lobster is one of my favorite places for lunch in Southern California. The view looking out into the Pacific Ocean and over the Santa Monica Pier are reason enough, but the food's pretty good, too - and that's the understatement of the year. I never seem to order lobster at its namesake eatery, largely because Denise generally does the honors in the crustacean department and I am always awarded a choice morsel or two from her plate - as long as I've been a good boy. It can be rather cool along the beach, too, unless it's the heat of summer. 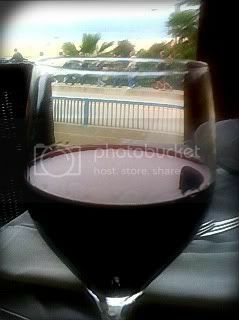 Sometimes that cool ocean breeze puts me more in the mood for a red wine. Then, I look for a meal more suited for that choice. The wine that caught my eye this time was a Garnacha from the San Alejandro vineyard in Calatayud, in the province of Zaragoza, Aragon, Spain. The Las Rocas Vinas Viejas is a rich ruby color with a big, jammy nose full of tar and black fruit. It doesn't taste as brooding as it smells, with strident blackberry and cassis flavors. It's $10 by the glass at The Lobster. This wine paired perfectly with Tasmanian trout salmon in a Port reduction sauce on creamy polenta with browned Brussels sprouts. For dessert, a little of Denise's lobster. I wrote earlier about the Vibrant Rioja tasting event in Los Angeles, focusing on the Lopez de Heredia wines. Here are some of the other taste treats I discovered at the tasting. Faustino had two wines I liked a lot. The Crianza '07 andReserva Cinco 2005 both show dense dark noses with earthy fruit. They taste just as rich as the nose leads me to believe they will. The Faustino Gran Reserva '98 is aging well and showing a trace of eucalyptus. Big flavors came from the Beronia table. The '07 Tempranillo (100%), '07 Crianza of Tempranillo and Garnacha and the '06 Reserva of Tempranillo and Graciano offer big, mineral-driven cherry flavors. The '01 Gran Reserva shows more depth, having been aged three years in barrels and three years in bottles. It blends Tempranillo, Graciano and Mazuelo. Beronia's III a.C. '04 is described as a "Super Rioja," blending Tempranillo, Graciano and Mazuelo grapes. Pepper, leather and tobacco notes adorn the cherry fruit. Antano's '09 Viura was one of my favorites, a nutty white with great acidity. The Conde de Valdemar Rosé impresses me quite a bit - one of the better $6 wines I've tried. CdV Inspiracion Valdemar 2007 shows a lovely bright cherry flavor. 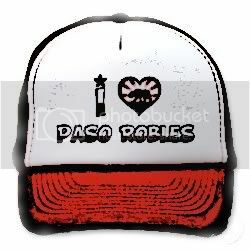 It's 100% Graciano. Bodeagas Landaluce poured some great wines, in particular the Tempranillo with the mocha nose and the Capricho de Landaluce '05. The latter is all smokey and lush, and it's one of the more expensive wines at the event, with a $47 price tag. Castillo Labastida's '08 Madurado is rustic and full of minerals, while their Reserva 2004 gives a nose and palate full of succulent black cherry. Navarrsotillo's Noemus Rioja Blanco '09 makes a huge tropical play, Noemus Rioja Rosado '09 is a 100% Garnacha rosé and the Noemus Rioja Tinto '08 blends Tempranillo with Garnacha and Mazuelo. It has a huge fruit expression. All three of those wines deliver a lot for under $10 each. Spend a little more - $19 - for the Magister Bibendi Rioja Reserva 2005 and you get a great red wine with fantastic tannins and no bite. 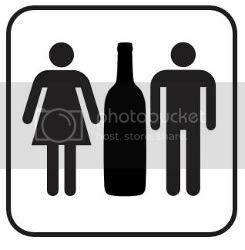 From Natalie MacLean's wine site, NatDecants, comes an article by Bill Ward in which he explores some of the differences between male and female behavior where wine is concerned. Ward looks at wine through the eyes of both sexes, highlighting the often opposite attitudes on wine. He quotes Ms. MacLean on how men and women approach wine. "Men are far more focused on the scores," she says, "and women on the stories behind the wines." Wine merchant Kristen Kowalski supports that claim. She says men typically ask to purchase wines based on the scores they receive from wine critics, while women tend to ask about wines they've seen paired with a particular recipe or wines with which they have personal experience with, say, in a restaurant. Ward also points out that women are much more likely than men to seek help when selecting a wine in a store or restaurant. Men prefer to do it on their own, even when they don't know what they are talking about. 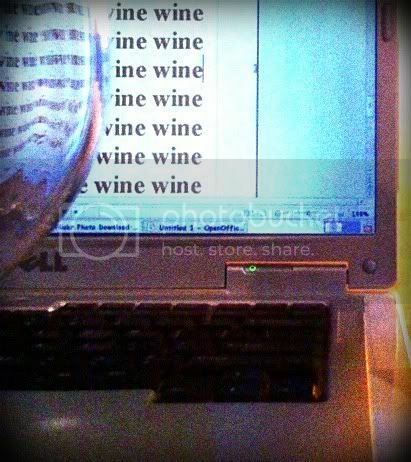 The article cites a British study which found that men tend to claim more knowledge about wine than they actually have. Kowalski also offers that "Men seem to find a comfort zone and stay in it." She says men tend to be intimidated by imported wines where they may have trouble understanding the information on the labels. Another retailer says when men find a wine they like, they are more apt to buy a case of it, while women seem to prefer buying mixed cases that offer more variety. Men and women may look at wine differently, but one thing stays the same between the sexes - wine is definitely a pleasure. 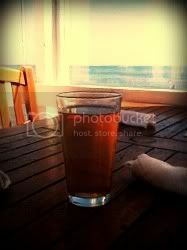 The calendar did not reflect it, but the weather didn't notice on a recent trip to The Beachcomber on the Malibu Pier. It looked and felt like summer to me, and I enjoyed a couple of summery beverages during a long lunch with the mom-in-law. Some may quip that lunch with a mother-in-law is always long, but she and I always get along just fine. Kona Brewing Company's Longboard Island Lager got things off to a great start. It's really yellow, with a nice head, white and fluffy. The taste is very clean and the hops are fresh with a touch of malt and a citrus edge on the palate. Service was quite slow, so another beverage seemed appropriate. I opted for an Edna Valley white wine I know and love, the Tangent Sauvignon Blanc. Grassy minerals and a nose full of citrus notes lead to a palate loaded with lemon zest and wet rocks. It pairs extremely well with sunshine and Mahi Mahi. If you've ever had a wine butter compound at a restaurant - a mixture of butter and red wine - you know what a great tasting condiment this is, especially a dollop on top of a nice juicy steak. I ran across a recipe for this concoction that you can easily make at home, from a fellow named Ben Carter, who goes by the name Benito on his Wine By Benito blog. It sounds so easy even I could do it. All you need is a half a cup of red wine and a stick of unsalted butter. Boil the wine slowly until it's like a syrup. Take care not to boil too long, or it will cake onto your pan. Mash the wine syrup into the butter until it is mixed well. 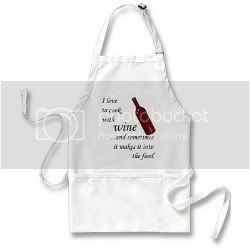 It may take a little doing to accomplish this, and Benito advises an apron - like the one pictured - or some old clothes for this procedure. When the butter is purple, put it on some wax paper and roll it into a log. Put it in the fridge and let it cool for six hours before serving. You can experiment by adding some garlic, chives or sage into the mixture. 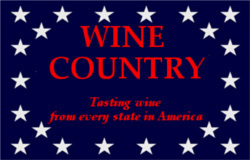 Russ Kane, in his great Vintage Texas Blog, has issued a plea to the government of the Lone Star State - "Don't forget about the Texas wine industry!" Kane recounts how Texas Governor Rick Perry made a little wager with Virginia Governor Bob McDonnell on the outcome of the NCAA women's basketball championship game. McDonnell is a Notre Dame graduate, and Perry was backing the ladies from Texas A&M University. Perry wagered a case of Texas wine - Viognier from Becker Vineyards - against a mixed case from Virginia's Barboursville Vineyards. Kane points out that Governor Perry's current budget proposal calls for slashes to funding for the Texas wine industry. An investment of just over two million dollars, says Kane, has helped turn Texas wine into a $1.7 billion cash cow for the state. Kane - and many others - don't want to see that growth stopped in its tracks. "The influx of dollars to the industry have helped to (1) identify the grape varieties best suited for the Texas soils and weather, (2) devise methods to handle vineyard diseases particular to Texas like Pierce’s Disease and Cotton Root Rot and (3) helped to investigate improved wine making techniques for the grapes that can grow in Texas. Most importantly, these funds have also gone to developing programs that are educating the vineyard and winery personnel critical to the new agricultural jobs in Texas." The upshot is, according to Kane, that the Texas legislature is trying to save 2 million dollars a year by cutting the legs out from under a business that generated $78.5 million dollars in tax revenue for the state in 2009. That doesn't sound like good business to Kane, and it shouldn't sound like good business to anyone else. This white wine comes from the Cheverny region of France's Loire Valley. Winemaking in Cheverny dates back as far as the sixth century, but the region is one of the newest appellations in the valley, attaining that status in 1991. French wine law states that all wines produced in Cheverny must be blends. Domaine Le Portail Proprietor Michel Cadoux and his clay-based soil produce a very nice blend of 80% Sauvignon Blanc and 20% Chardonnay. It's available by the glass at Le Clafoutis in West Hollywood's Sunset Plaza for just $8. We had the best table in the house for lunch, right by the wide front doors. They had been swung into the open position to let in the sunlight and the cool breeze. Tables were available on the sidewalk just through those doors, but we were near enough to experience the outdoors with all the comfort of indoors. That Cheverny Blanc has a nose with some light grass and herbal notes, with a strong aroma of minerals. On the palate there is plenty of fruit, along with flavors of green olive - Denise says it's Lucques olives - and a hint of capers. It was right on target with the chicken piccata and the chopped salad with chicken and beets. 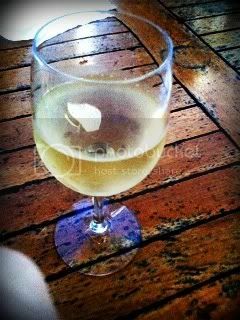 Wines And Vines reported on a study done by Wine Opinions which found that high-frequency wine drinkers prefer consuming their favorite beverage at places other than the dinner table. The report states that only 41 percent of the wine consumed in America is paired with a meal. 59 percent of it is consumed without food, while preparing a meal or with snacks. The amount of strictly solo wine drinking is 26 percent. More figures are available in the report, which featured demographic and lifestyle breakdowns on wine consumption. In what may come as a surprise to many, the stats showed that those high-frequency wine drinkers aren't all that concerned with food and wine pairings. Also, white wine is the go-to "cocktail" wine for only 25 percent of the respondents. The high-frequency wine consumers in this study are defined as people who drink wine daily or several times per week. The daily wine drinkers accounted for 29 percent of the respondents, while 54 percent had a glass of wine several times weekly. The biggest surprise of the report for me was that not even 30 percent of wine drinkers in America have a glass on a daily basis. I have a glass of wine nightly, which has prompted some good-natured ribbing from my wife on occasion regarding what a "lush" I am. I don't feel that a glass a night puts me in Foster Brooks territory, but then I suppose that might depend on the size of the glass. In her must-read wine law blog, On Reserve, Lindsey Zahn writes about the Comprehensive Alcohol Regulatory Effectiveness Act - known last year as H.R. 5034 - which is rearing its ugly head again this year as H.R. 1161. Zahn says this year's bill is identical to the second version of the proposed legislation introduced to the U.S. House of Representatives last year. Zahn quotes the main sponsor of the bill, Republican Representative Jason Chaffetz of Utah, as saying that he goal of the Act is to recognize and reaffirm that alcohol is different from other consumer products, and that it should continue to be regulated by the states with unprecedented powers to regulate wine in interstate commerce. There has been strong reaction from opponents of the bill. Democratic congressman Mike Thompson of California is quoted as saying, "The federal government has no business picking winners and losers in the wine, beer, and distilled spirits industry. Yet the Comprehensive Alcohol Regulatory Effectiveness Act would do just that by banning the direct shipment of wine and other forms of alcohol in the U.S."
The bill, according to Thompson, "would allow individual states to replace federal standards with their own, making it harder for out-of-state producers in California and elsewhere to comply with other states’ laws." Many states already have antiquated alcohol laws on the books which serve to prop up what is known as the "three-tier system" of distribution, in which state-supported middlemen stand between wine producers and their desired products. The Now And Zin Wine Country series keeps rolling across America, shedding a little light on wine producing areas somewhat lesser-known than California. Minnesota - The North Star State - has been billed on the state's license plates as "The Land Of 10,000 Lakes." I'm told that lakes actually number closer to 12,000 in Minnesota, but who's counting? Apparently someone is, but let's just say there are way more lakes than vineyards in Minnesota. We'll keep an eye on that, though, because the Minnesota grape industry has seen huge growth in recent years. The number of vineyards in the state doubled between 2003 and 2008. Even so, the state's grape and wine industries are still young. Minnesota's wine production in 2009 was ranked the eighth lowest in America, at just over 114,000 gallons. It gets cold in Minnesota, so winemakers there rely largely on grape varieties that are hardy enough to survive the winters. French hybrids are popular, and the state has even created its own varieties like Edelweiss and St. Croix specifically for their cold weather durability. The University of Minnesota's oenology program came up with the Frontenac and Marquette grapes. Fieldstone Vineyards in Redwood Falls, Minnesota responded to my request for an entry in this series. Thanks to owner Charles M. Quast and owner/winemaker Mark Wedge, who provided me with a bottle of their Marquette wine to sample. Fieldstone is the state's largest 100% Minnesota-grown winery, and they use grapes from a network of Minnesota growers. The vineyards and winery are just two hours southwest of the Twin Cities and a couple of hours northeast of Sioux Falls, South Dakota. They utilize some of those hardy grapes like Frontenac, LaCrescent, St. Pepin and Marquette. Fieldstone was founded in 2003, at the beginning of a big growth in the state's wine industry. Their menu includes semi-sweet white wines made from LaCrescent, Frontenac, and Edelweiss and a semi-sweet Frontenac rosé. Their reds range from sweet to dry. The Marquette wine I sampled is dry. 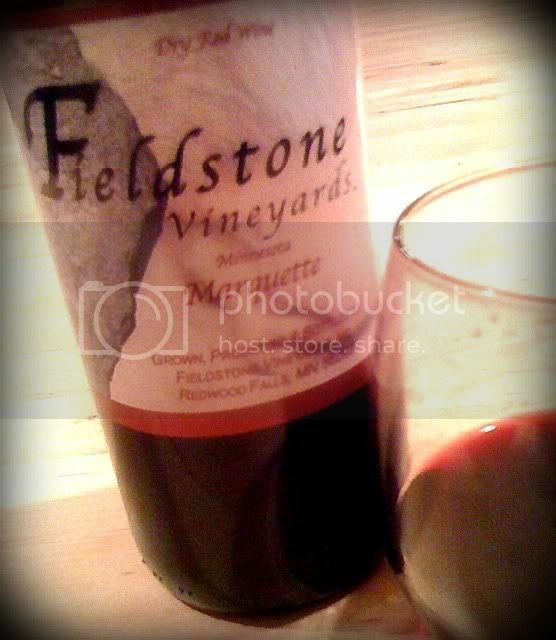 The Fieldstone Marquette is a very dark colored wine, so dark I can hardly see through it. A grapey nose shows some herbal notes, too. The wine runs a bit hot at first, with a noticeable presence of alcohol. Decant - or just let it sit in the glass - for an hour or so, and things change dramatically. The grapiness just about goes away and a slight sense of tar joins the herbal bouquet. The tannins settle down, too, and the wine becomes silky smooth. It's very dry and a bit tart, with lots of minerality and a fair amount of acidity. After the time to open up, the Marquette's dark, sour blackberry flavor is really a delight. If other wineries in Minnesota produce wines as interesting as the Fieldstone Vineyards Marquette, the state's small wine industry should be in for more big growth. It was a Spanish wine tasting event that really got me started exploring wine years ago, and I am repeatedly drawn back to events which feature Spanish wines. 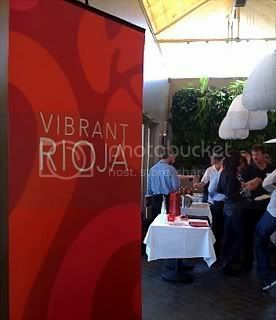 The Vibrant Rioja tasting event of April 11, 2011 jumped onto my calendar instantly. It was held at Hatfield's Restaurant in Los Angeles. The room was perhaps a little small for the gathering of 20 or so importers, all pouring a number of wines at their tables. Space was extremely limited and enthusiastic wine dealers, sommeliers and writers jammed the dining area for the afternoon event. Great wines abounded, and I'll cover some of them in another post. Today I want to concentrate on my favorite table of the event, the one that was so crowded the whole afternoon I could hardly edge myself in for a few tastes. That would be the table where the wines of Lopez de Heredia were poured. Lopez de Heredia was founded in 1877 and is a Rioja institution, still owned and operated by the same family. They are particularly proud of their Tondonia Vineyard on the right bank of Ebro River, around which the Rioja region is drawn. Heredia also has three other vineyards, also in Rioja Alta - Cubillo, Bosconia and Zaconia. The winery is known as much for white wines as for red, maybe more so. They age their whites and rosés in much the same manner the reds are aged, and they stand as a testament to age-worthy whites. White, pink or red, this is what old-world wine is all about. Heredia's Viña Gravonia 2000 Crianza is a white wine made from 100% Viura grapes. This golden treat is tasting great, with a smokey and nutty taste. It's nice and dry with great acidity. Viña Tondonia Rosado Gran Reserva 2000 - This brownish peach-colored rosé is a blend of 60% Garnacha, 30% Tempranillo and 10% Viura. The unusual, smokey nose leads to a palate decorated with a nutty strawberry flavor. Viña Cubillo Crianza 2005 - A red blend of 65% Tempranillo, 25% Garnacha and some Graciano and Mazuelo filling out the rest, this wine offers a hint of anise on the nose and rustic, earthy cherry flavors. Viña Bosconia Reserva 2002 - Smooth, dusty cherry aromas and flavors dominate this blend of 80% Tempranillo, 15% Garnacha and Graciano and Mazuelo. It's aged in French oak for five years. Viña Tondonia Tinto Gran Reserva 1991 - Heredia says 1991 was one of the best vintages in the history of the Tondonia Vineyard, and this wine bears out that claim. Toasted vanilla notes and a full mouthfeel are featured in this very dry Tempranillo/Garnacha blend filled out with Graciano and Mazuelo grapes. Aged in barrels for nine years, this wine is old-world elegance defined. Viña Ijalba Graciano 2007 - Amanda Linn of WineWise was also pouring this new-world style, almost as an afterthought. Its extreme fruitiness was delicious and served as an excellent counterpoint to the Heredia old-world style. A recent article in The Wine Economist explored a question that's always on the minds of those interested in wine - what's the next big thing? Figures cited in the story - taken from another article in Wine Business Monthly - show that sales of Moscato wines increased by about 91% during 2010, when overall wines sales only grew by just under five percent. The Wine Economist speculated that some White Zinfandel drinkers may be moving over to Moscato, as sales of White Zin have fallen off a bit. The originator of White Zinfandel - Sutter Home - produces a Moscato Alexandria, while the article also cites Moscato entries from Robert Mondavi Woodbridge, Barefoot Cellars, Columbia Crest and other wineries. In the comments to the article, a reader suggested much of Mocasto's newfound popularity may be due to hip-hop artist Drake, who sang about the grape variety in his 2009 single called "Do It Now," in which he raps for "lobster, shrimp and a glass of Moscato." Popular culture has certainly affected the wine industry before. Rapper Jay-Z put an obscure Champagne by the name of Armand de Brignac on the map when he featured it in his 2006 video for the song, "Show Me What You Got." Now, reportedly, the French producer can't make enough of it. The 2004 film "Sideways" was credited - or blamed - for ruining the market for Merlot. One of the movie's characters had a decided bias against that particular grape, preferring Pinot Noir. Sales of Pinot Noir went up in the "Sideways" aftermath. The numbers are out, and Americans can give a big "We're number one!" cheer, because in 20-10 the U.S. surpassed France as the nation consuming the most wine in the world. According to Wine Institute, the tally came to 330 million cases, up two percent from the previous year and a record high for the industry. All that wine is said to be worth $30 billion, and that number is four percent higher than 2009. What kind of California wines are we drinking in such great quantities? The report went on to show 53 million of those cases were California Chardonnay, while 33 million cases were Cabernet Sauvignon from the Golden State. California Pinot Noir, Zinfandel, Riesling and Muscat also showed an uptick in consumption. Some of us may have been celebrating our new status early, as U.S. consumption of sparkling wine and Champagne was up ten percent, to 15.4 million cases. Reports of the health benefits related to alcohol consumption - particularly wine consumption - seem to pop up regularly. Here's another one, which appeared recently in Wine Spectator magazine. A German study has found that light to moderate drinking seems to help stave off the effects of dementia, even in people older than 75. According to the article, "on average, the daily consumption of alcohol reduces the risk of dementia by nearly 30 percent compared to nondrinkers. Additionally, the risk is another 30 percent lower for people who drink between one or two servings per day." These are the findings from a three-year study of 3,200 patients. Although the sample is small, the researchers put a lot of credence in the numbers, and so does the medical community. The magazine says the International Scientific Forum on Alcohol Research found the results of the German study convincing. The Forum also notes that "Happy people with many friends have the most opportunities for social drinking and, in this study, alcohol consumption was significantly associated with factors that are protective for the development of dementia: better education, not living alone and absence of depression." Despite these issues, the study shows the risk of dementia to be lower among light to moderate drinkers, and lower still among those who drink wine. California's Santa Barbara County offers some tremendous wines, many of which come from the Sta. Rita Hills appellation. The area lies between the small towns of Buellton and Lompoc, and is cooled by winds from the Pacific Ocean which blow along the Santa Ynez River. The winegrowers of this region gathered recently at Palate Food + Wine in Glendale, California to pour some of their best. The public packed the house on Sunday April 3, 2011. I attended the trade tasting event the following day. The Sta. Rita Hills region is home to big names like Longoria, Sea Smoke, D'Alfonso-Curran, Cargasacchi and Foley, as well as rising stars like Zotovich, Weber and Flying Goat. I sampled the wines of ten Sta. Rita Hills producers at this event. Peter Cargasacchi planted the Cargasacchi and Jalama vineyards in the late 1990s. His Italian and winemaking heritage are points of pride, as are his wines. Peter was manning his own table and poured some exceptional wines for me. His '09 Jamala Vineyard Pinot Noir is rich and dense, while the '07 Pinot Noir shows nice minerals and spices with a good acidity. The Cargasacchi Pinot Grigio Dessert Wine is succulent. Peter explained that he gambled on good weather and left the grapes on the vines an extra ten days for additional ripening, harvesting them at 40 brix. Wes Hagen advises you lay down his Clos Pepe Estate Pinot Noirs for four or five years to get maximum expression from them, but nobody will fault you if you can't wait that long. Wes and his wines always draw a big crowd at every event where I've seen him pouring. His Pinots show great minerality with hints of chocolate peeking from behind the fruit. As a treat, Wes was pouring his Clos Pepe '01 Estate Pinot Noir in addition to more recent releases. Morgan Clendenen's Cold Heaven Cellars poured several Viogniers, as she's best known for her work with that variety. Her Le Bon Climat Viognier shows off a lush mouthfeel and an abundance of honeysuckle aromas with plenty of minerals on the palate. Cold Heaven's '09 Viognier from the Sanford and Benedict Vineyard has a great citrus zest profile, while the Santa Ynez Valley Viognier is produced using a Viognier clone that was once thought to be Roussanne. One taste will show you why that mistaken identity came about. Her gentle Pinot Noir, "Nevertell," is grown in a Sta. Rita Hills vineyard - which one? She'll never tell. Kris Curran and Bruno D'Alfonso, of D'Alfonso-Curran Wines, have many fans, myself included. D'Alfonso's history with Edna Valley Vineyards and Sanford Winery and Curran's with Sanford, Cambria, Koehler, Sea Smoke and Foley form a pedigree that would be difficult - if not impossible - to match. The D'Alfonso-Curran 2008 Chardonnay from White Hills Vineyard was one of the hits of the event. Big, buttery and smokey in the tradition of California Chardonnay, this wine also has a zippy acidity. A trio of '06 Pinot Noirs on this label hail from different vineyards but show a high level of winemaking skill. On the Badge label, the '06 Sta. Rita Hills Pinot Noir is loaded with minerality and great acidity. The latter quality is a hallmark of the duo's wines. Norm Yost's Flying Goat Cellars poured a couple of winners. The '09 Goat Bubbles is a rosé of Pinot Noir sparkling wine, light and airy with tons of summery flavors. Flying Goat's Pinot Noir Rancho Santa Rosa Sta. Rita Hills is rustic and earthy. Norman Huber is not only a winegrower, but a woodworker, too. His handiwork is on display aboard the Queen Mary in Long Beach, as he headed up the restoration of the grand lady of the sea. His custom-built bars grace the tasting rooms of fellow SRH winemakers Longoria Wines and Fiddlehead Cellars. Huber's '08 Chardonnay is steely with plenty of bracing acidity and tropical flavors. The '08 Huber Pinot Noir has a beautiful bouquet and feels lovely on the palate. It's a pity they ran out of his Dornfelder. He devotes a portion of his vineyard to that grape as a tribute to his German upbringing. Dan Kessler of Kessler-Haak Vineyard and Winery poured his 2010 Rosé of Pinot Noir made from the grapes of the estate vineyard. It's lush, and you'll want more. Kessler-Haak specializes in the main grapes of the Sta. Rita Hills, Chardonnay and Pinot Noir. They also do a fine Syrah with Turner Vineyard fruit. It's bold and spicy. Rick Longoria started making his own wine in 1982 and opened Longoria Wine in '98, the first winery to locate in what would come to be affectionately known as the Lompoc Wine Ghetto. Longoria sources his wine from choice locations in Santa Barbara County, including the Sta. Rita Hills. His '07 Tempranillo was one of my favorites at this event. The grapes come from the Clover Creek Vineyard and the wine is edgy with a great mineral presence on both the nose and palate. Pali Wine Company scored with their '08 Fiddlestix Vineyard Pinot Noir, sporting cinnamon, raspberries and strawberries. Pali's '08 "Huntington" Pinot Noir has 60% Sta. Rita Hills fruit, 35% Santa Maria Valley grapes and 5% sourced elsewhere in Santa Barbara County. It's nice and earthy. Weber Wine Company sources fruit from the Sta. Rita Hills as well as Paso Robles, Sonoma Coast and Dundee Hills in Oregon. Their '09 "Mishelle" Pinot Noir is from Babcock Vineyard. Earthy notes dominate the nose while the palate is a bit tart, yet smooth as silk. Earth Day is April 22nd, 2011, and Wine Institute reports that many California wineries have events scheduled throughout the month to attract eco-friendly wine lovers. A number of wine country hotels and travel companies are also offering travel deals to make the trip a little easier and less expensive. For Wine Institute's list of events and lodging, visit their website. Take a look into the world of California wine here. Northern California wineries in Napa Valley, Sonoma County, Livermore Valley, Anderson Valley, Mendocino County and the Sierra Nevada Foothills have specials planned for the month of April. Central Coast wineries in Paso Robles, San Luis Obispo's Edna Valley, the Santa Cruz Mountains, Santa Barbara County and Southern California's Temecula Valley will also be celebrating Earth Month with special events. The 5th Annual Earth Day Food & Wine Festival will take place the weekend of April 15th at Pomar Junction Vineyard and Winery in Templeton, California. Food, wine, barrel samples and music will set a festive scene for the celebration of ecological care. A daytrip to the Temecula California wine country found us at Ponte Family Estate Winery. Overseen by Claudio Ponte, the joint was jumping on a spring Saturday afternoon. Granted, it was the World of Wine barrel tasting weekend, but I was assured by several staffers the crowd was not unusually large for a Saturday afternoon. Ponte's tasting room is festive, the restaurant - the Smokehouse Winery Restaurant - does good business and appears to satisfy, judging from the smiles on the diners' faces. I'm also judging from the samples offered in the barrel room over the weekend event. The Ponte Winery motto is stated on their website: "If you like it, then it's good wine." So heartfelt is that mission statement, they have registered the thought as a trademark. Winemaker Mark Schabel does his part to make sure you like the wines. The 2009 Viognier has a nose of pears and melons with some tropical flavors and a lively acidity. Framing the fruit is an intriguing savory, nutty edge on the palate. It retails for $24. The '09 Sangiovese barrel sample shows very bright cherry flavors, good acidity and mellow tannins. It's rustic and deemed "not ready yet" by the winemaking crew, but it's definitely getting there. I was told it should be ready for release "sometime this year," by the gentleman pouring for us. A couple of tasty food samples were provided along with the wines. Arancini - Italian rice balls - were provided to those tasting. They paired beautifully with the Viognier, and when adorned with the duck Bolognese sauce, went well with the Sangiovese. Executive Chef Greg Stillman and Sous Chef Vincent Logan (pictured) are to be commended for turning out a large quantity at high quality. Logan told me early Saturday afternoon, "We did 800 of the Arancini, and we're running out. So Greg's in the kitchen working on another batch." As I said, they do a good business at the restaurant. After Ponte, we were to meet some friends at Maurice Car'rie Winery, which works in tandem with neighboring Van Roekel Winery. A fun tasting room in a Victorian style house offers some fun wines at the winery established in 1986. Most of the wines are a little on the sweet side for me, but that's what Jose and Heather like about them. It's their favorite Temecula winery. They do make great sippers on the porch, though, especially the whites. Winemaker Gus Vizgirda is of Lithuanian ancestry and studied German wines while serving in the U.S. Air Force there. A door in back leads to the barrel room, where we tried a new release and a not-quite-released barrel sample. Some spicy little meatballs were kept over heat next to an array of cheese and bread. After the barrel room, we took a table on the porch, where Jose produced a couple of bottles of his favorites. There are some picnic tables on the grounds also available. Sampled in the back room was the 2010 Sauvignon Blanc - a slight grassiness was offset by a sweet side. Pineapple and tropical notes abound. A barrel sample of the '10 Chardonnay - only 4 months in oak so far - shows very nice tropical fruit as well. They are giving it some more time in the barrel, but for my palate the oak is just right. Pineapple Champagne caught my eye in the tasting room. It isn't really Champagne, of course, and has a small amount of pineapple juice augmenting the sparkling wine. It's tasty and fun, much like a sparkling cocktail. The 2007 Cabernet Sauvignon is simple on the nose and palate. We drank it chilled outside and it was enjoyable. The 2010 Riesling has a honeysuckle nose, tasting of pears with good acidity, especially on the finish. It was fantastic with the bread. Oh, the bread! Baked Brie and Sourdough loaf, with the brie baked inside. It's available baked on weekends only - lucky us - and unbaked every day. This Italian wine proved to be a little hard to find in Los Angeles once it dropped off the restaurant wine list on which it was discovered. My friend Marge found and fell in love with the '08 vintage of Fata Morgana Greco at an eastside eatery recently. After putting in some diligent work tracking down the wine, she ended up finding the 2009 bottling. She bought a case and is quite happy with her purchase. From the Fattoria San Francesco Winery, the wine is made from 100% Greco di Bianco grapes sourced from a vineyard featuring 20-plus year-old vines in Calabria, in the toe of Italy's boot. The loose, sandy soil over volcanic chalk and limestone in which they are grown makes its mark in the form of a nice minerality in the wine. Fermented in stainless steel vats, the Greco undergoes malolactic fermentation - which tends to leave a creamy mouthfeel - and ages on lees for 8 months before bottling. That means the wine is not removed from the dead yeast that drops to the bottom of the vat. It gives a bit of a yeasty feel to the palate. The nose is floral and tropical, and the wine feels full-bodied - not a surprise. This white has a great acidity level making it very food-friendly. It paired well with Sheryl's jambalaya and even with sauceless pulled pork. I gave it big pairing points for its performance with sweet items, sweet-corn cornbread and pralines. Fata Morgana has a 12.5% alcohol level and sells for around $15. If you'd like to find it for yourself, here's how Marge did it. "I bought mine through Susan Brink at Venokado, 7714 Fountain in West Hollywood. She bought a case for the store when she bought mine." You might want to hurry. A great bunch of Ventura wine people showed off a great bunch of wine in Thousand Oaks recently. Four Brix Winery invited some media representatives to their tasting room in The Wineyard on Thousand Oaks Boulevard. I was fortunate to be included in the group who tasted some of Four Brix offerings. Gary Stewart (pictured) hosted, while Lora Simonsgaard helped me taste through a flight of really exceptional wines. Four Brix is located in Ventura County, and they source their grapes from a variety of great California regions - Santa Barbara County, Paso Robles, Monterey and Sonoma among them. Their wines are predominately blends - they do a fantastic job getting the mixtures right for incredible bouquets and delightful flavors. Many of their wines use grapes from a specific area, even though the labels denote a rather generic "California" designation. I suggested to them that they use more specific designations for a little more "label pizzazz," but they were way ahead of me. The next vintages of several of their blends will feature designations of "Central Coast" and "Paso Robles" on the labels. Smitten 2009 - The only white on the table for this event is a Viognier/Marsanne blend. The '10 vintage won't have as much Marsanne, only 5%, I'm told. The '09 shows the Viognier well, with a lovely, floral nose and a little white pepper. The nose is so full and the mouthfeel so creamy, I assumed some oak is involved. Not so, though - it's a stainless steel white. Roseo 2010 - This is a barrel sample, as the wine is scheduled for a May 14th release. It's Grenache-based and some Zinfandel is used in the mix. It's unusual, but it works. A big strawberry nose meets great acidity and fruity flavors on the palate. It's definitely a wonderful rose for food. The crew at Four Brix is shooting for a price point under $15. Temptress 2008 - A five grape blend of Tempranillo, Mourvèdre, Grenache, Petite Sirah and Zinfandel, this one is juicy and spicy on the nose with a dash of cinnamon showing. Big, red fruit flavors are joined by good minerality and acidity and plenty of spicy notes. I'd love a piece of smoked sausage with this wine. The '09 vintage will be labeled Central Coast. Rhondevous 2008 - Syrah, Mourvèdre, Grenache and Counoise make up this vintage, while the '09 will feature Grenache in the lead position. The nose is fragrant and lovely and the taste is spicy blackberries. It's all San Luis Obispo County fruit despite the "California" label. Look for a Paso Robles designation on the label for the '09 vintage. Scosso 2008 - Sangiovese, Cabernet Sauvignon and Merlot make up this beauty with a smokey, bright cherry nose and deep, rich flavors of spicy dark berries. The name comes from the Italian horse race called the Palio di Siena, which is held in the town square. It's a rough race in which horses sometimes finish without their jockeys, a condition known as "scosso." You'd be well advised to stay in the saddle for this ride, though. The Sangiovese is sourced from McGourty Vineyard on Paso Robles' west side. Petite Sirah 2008 - Fruit from Sonoma County's Gold Hawk Vineyard brings the Russian River Valley to Ventura County. A 100% varietal wine, the nose is dark and spicy with an iodine note while the palate is fruity and tannic. The 2010 vintage will feature Charbono in a blend, from Calistoga's Frediani Vineyard. One of the Four Brix wine wizards, Gary Stewart, told me about going to the vineyard to harvest the Charbono grapes. Due to a quarantine caused by the European grape moth, Stewart was not allowed to bring the grapes to the crush facility. He had to "field press" the grapes right there in the vineyard, leaving the leaves and stems behind! No doubt, that extra effort will be appreciated when the vintage is ready. All the wines at this tasting were paired with Vosges Haut Chocolate from TIFA Foods, an Agoura Hills venture. Mike Ashamalla was on hand to describe each morsel. The chocolate with notes of Indian curry and coconut paired with Smitten, while a disc made from Fiji beans went with the Roseo. Temptress paired well with an Indonesian chocolate with earthy, mushroom flavors and one with spicy Ancho chipotle and cinnamon elements scored with Rhondevous. Scosso was a hit with a Madagascar chocolate with a dark, smokey edge. TIFA is working with Four Brix Winery on a project to create chocolates especially for their wines.